Chandrababu Naidu has resorted to enough theatrics in Delhi to catch the attention of the people and the media. He has also managed to bring together all those who wanted to scream at Modi. They all vented their ire on Modi. But, the BJP leaders are not amused. They are unable to digest the fact that Chandrababu has enjoyed power all these days thanks to BJP alliance with him and had always maintained that special package was better than special status, but is now heaping invectives on Modi. The BJP feels Chandrababu wants to project the BJP as a villain. He wants to reap benefits by vilifying the BjP. The BJP is not taking to this kindly. It is now trying to teach him a lesson. Sources say that the BJP might speed up the probe inthe cases registered against him. Cases like the cash for votes scam and others. He is facing these cases. Even his son Lokesh's name too has figured in some cases. So, the BJP might activate the agencies under its helm and is trying get back at Chandrababu. Only factor that is pulling them back is the lurking doubt that it could even trigger sympathy for Chandrababu and prove counter-productive. 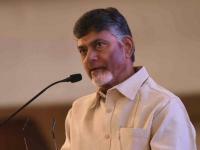 × RELATED Did Naidu Borrow 5000 Crore For Pasupu Kunkuma?